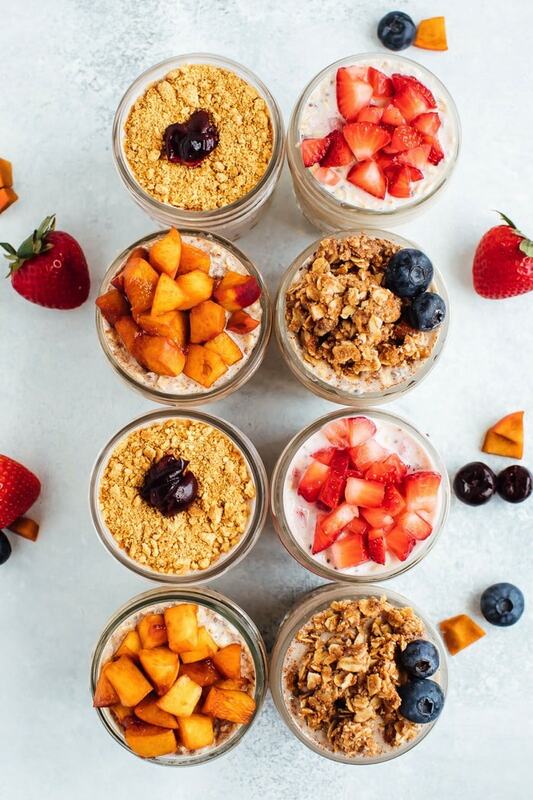 Four new summer fruit overnight oats recipes to add to your rotation! All four are themed around fruity summertime desserts — strawberry shortcake, peach pie, blueberry cobbler and cherry cheesecake. Serve them for breakfast, snack or even dessert… they’re that good! Summer, summer, summertime! I’m ready for your long days, your sunshine, your produce! I enjoy all of the seasons but summer is hands down my #1. I feel like Richmond comes alive in the summer. The sun is shining, there are so many events going on, everyone is outdoors — it’s the place to be! I feel like summer is when my overnight oats kick really comes alive too. 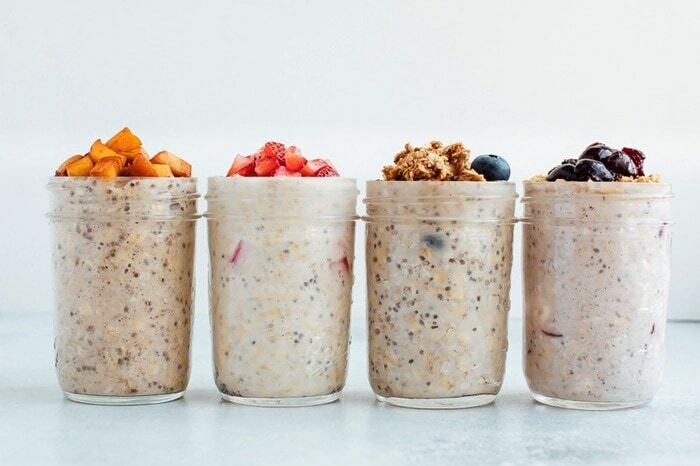 I love having a fresh, cold breakfast ready to go when I wake up in the morning, so overnight oats are my jam. What better way to flavor them than with summer fruit?! Yes, these do all share names with desserts… don’t be surprised if I serve them for dessert at a summer BBQ. They’re that good and I can already tell they’d be so adorable served in mini mason jars. Ready to hear about all four flavors? Let’s do it! The cherry cheesecake overnight oats are extra rich thanks to the cream cheese. I really don’t know if there is anything better than fresh cherries, so bookmark this to make when cherries are in season this summer. I had to use frozen because I’m sharing this post early, but I cannot wait to make this recipe with fresh cherries. 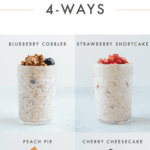 If any of these four overnight oats are going to be on my daily rotation, I see it being the blueberry cobbler overnight oats. They’re so delicious but use super simple ingredients that I typically have around the house any given day. The crumble topping takes these oats off the charts, but if you’re in a rush or don’t have the ingredients, granola works great as a sub! Strawberry shortcake — does that make you think of the dessert or the cartoon?! It made me think of the rich summertime dessert, but not anymore! 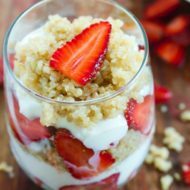 This light, refreshing breakfast (or snack or dessert!) tastes like the real deal without loads of sugar. The Greek yogurt in this one makes it extra creamy and gives it a little boost of protein. You can thank me later! My mouth is watering just thinking about the peach pie overnight oats. I only buy peaches in the summer (usually July or August) because I know they just won’t be any good any other season (at least in Richmond). Is there anything better than a fresh, ripe, juicy peach? No, no there isn’t. 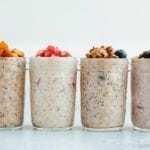 Four new summer fruit overnight oats recipes to add to your rotation! All four start with the same basic recipe. 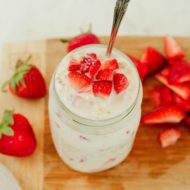 Add milk and cream cheese into a half-pint mason jar and stir/mash together until cream cheese has broken up into little chunks. Add oats, sweetener, chia seeds, vanilla and cherries into the jar. Stir ingredients together. Place lid on jar and shake to combine a bit more. Place in the fridge overnight (or just 30-60 minutes if you’re making these the morning of). 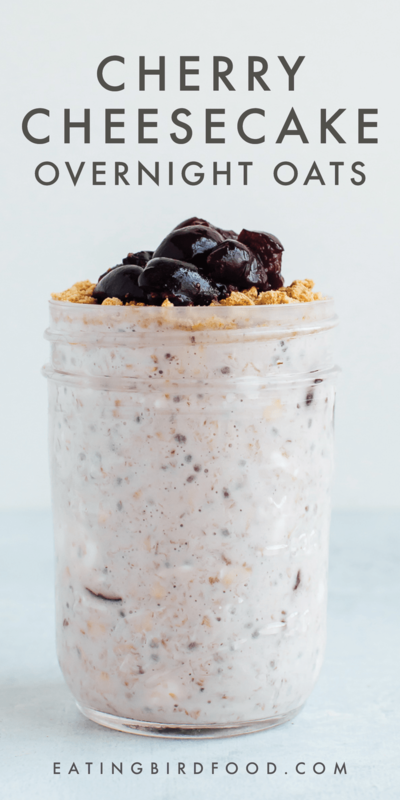 To serve: remove lid from jar and top overnight oats with crushed graham crackers and extra cherries. You can eat the oats straight from the jar or pour into a bowl. 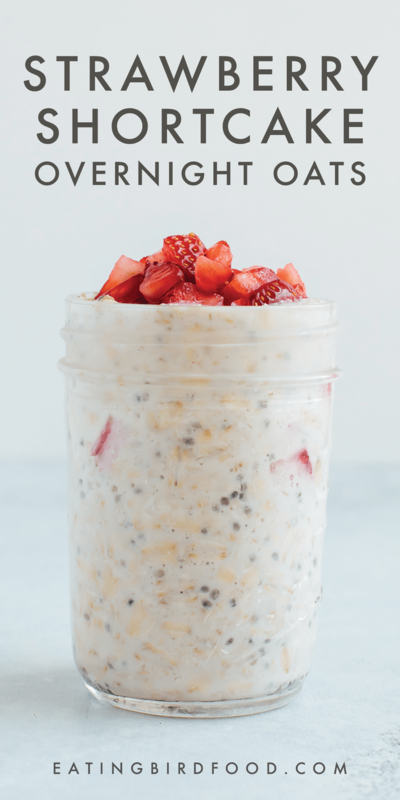 Add oats, milk, yogurt, sweetener, chia seeds, vanilla, almond extract and strawberries into a half-pint mason jar. Stir ingredients together. Place lid on jar and shake to combine a bit more. Place in the fridge overnight (or just 30-60 minutes if you’re making these the morning of). To serve: remove lid from jar and top with extra chopped strawberries. You can eat the oats straight from the jar or pour into a bowl. 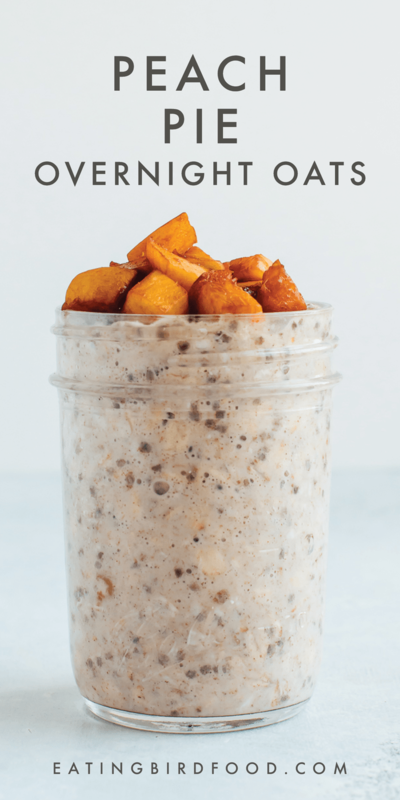 Add oats, milk, sweetener, chia seeds, vanilla, cinnamon, ginger and peaches into a half-pint mason jar. Stir ingredients together. Place lid on jar and shake to combine a bit more. Place in the fridge overnight (or just 30-60 minutes if you’re making these the morning of). To serve: remove lid from jar and top with extra chopped peaches. You can eat the oats straight from the jar or pour into a bowl. 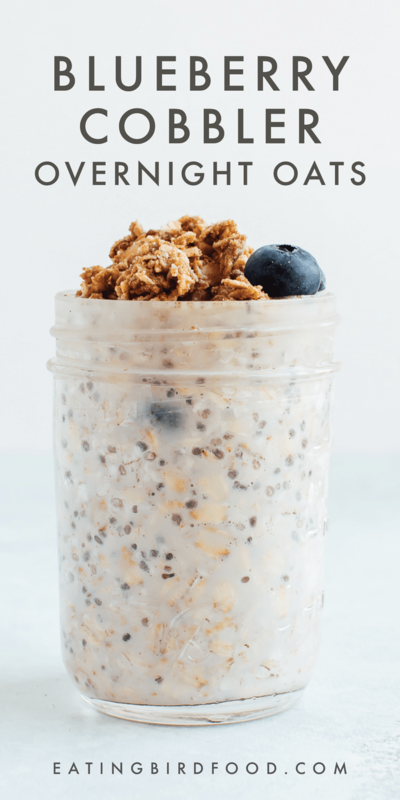 Add oats, milk, sweetener, chia seeds, vanilla and blueberries into a half-pint mason jar. Stir ingredients together. Place lid on jar and shake to combine a bit more. Place in the fridge overnight (or just 30-60 minutes if you’re making these the morning of). Make crumble topping by combining all ingredients in a small bowl. Let sit in the fridge overnight as well. To serve: remove lid from jar, crumble the oatmeal topping over the oats and top with extra blueberries. You can eat the oats straight from the jar or pour into a bowl. Okay, I’m dying to know! Which one are you going to try first? 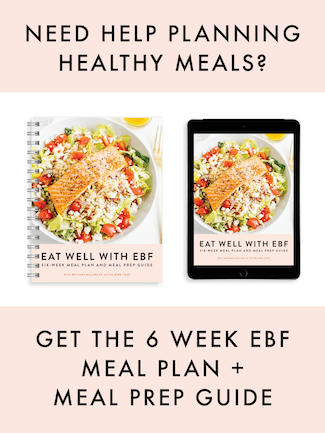 Let me know in the comment section and don’t forget to leave a star rating once you try the recipe! This real-time feedback is helpful for me and everyone out there reading. I wish I didn’t have to click out of feedly now to read your posts. It makes me much less likely to read your content. Hi Amy! Is this a change that feedly recently made? 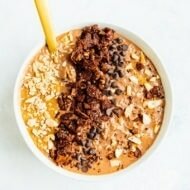 Have you tried this with steel-cut oats? I don’t know if it would work–I’m not any kind of cook, so I have no idea. Vanilla you find in the baking section of the grocery store. It’s a Flavoring. Also known as Vanilla Extract. Hope this helps. They all look good, but I’m looking forward to trying the peach pie first. The peach pie is delicious and perfect right now while peaches are seasonal, ripe and juicy. Can’t wait to hear what you think of it.